For The Woodlands, Texas residents who are using a junk removal service for the first time, there may be some questions about how the process works. Do you need to bring your unwanted items outside for us? How much will it cost? These are all valid questions that we have been asked by our residential and commercial customers. To help you better understand what to expect when you contact Junk Removal of The Woodlands for assistance with the disposal of appliances, furniture, yard waste, bulk trash, or other unwanted items, we have created a page to outline how our service works. We want to make sure customers to have no hesitation calling Junk Removal of The Woodlands for their junk disposal and recycling needs. The first step is to call and speak with someone from Junk Removal of The Woodlands about the specific service you are interested in. Based on the details you provide us, we can offer you an approximate estimate of how much it will cost for our professional junk removal service to come help you dispose of your unwanted items or trash. An consultation appointment can also be made – free of charge – for a member of our team to come have a closer look at the object you need us to haul away in order to provide you with a more accurate quote. We are upfront about our costs and strive to give our customers the most honest and accurate estimates for our junk removal services. If you are satisfied with the price that you have been quoted, you can proceed to book a convenient date and time for us to come assist you with the removal of your junk, There is no pressure to book our services immediately after obtaining an estimate. Feel free to call around for estimates from our competitors. 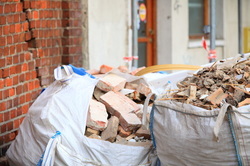 We are confident that Junk Removal of The Woodlands offers the most reasonable prices for junk disposal in the area. On the day of your appointment, we will call ahead of the scheduled time to give you a friendly reminder that our junk removal professionals will be stopping by soon. Junk Removal of The Woodlands typically sends a large truck and at least two members of our team to each appointment to ensure that your unwanted items can be safely and efficiently removed from the property. Before beginning our work, we will carefully go over and confirm the items you want disposed to make sure that there are no mixups or misunderstandings. Once we have your approval, our junk removal will get to work hauling the specified items from your residential or commercial property. After removing the unwanted items from your home or business, Junk Removal of The Woodlands will make sure that everything is properly sorted for donation, disposal, or recycling.